All I’m trying to do is stay afloat. That’s it. Parent my child, work, breathe, repeat. I’ve been so stressed out I barely eat. Seven months after giving birth, I’m practically back to my pre-pregnancy weight of 85 pounds. It wasn’t about working out or eating right. It’s all about surviving a natural catastrophe in the form of San Francisco’s stormageddon. I honestly just want to crawl into a dry cave and sleep for 8 hours straight. I’m not asking for much! Despite the bump in the road I’ve been facing, my blog is chugging along like the Little Engine that Could. I’ve got three announcements to make. Ready? 1. Let’s start with the accolade. Dear Vixen is listed as one of FlipKey’s Top 20 San Francisco-based Bloggers. I am beyond thrilled to be nominated along with some of my very favorite local blogs. I feel like I won the lottery! 2. For several months now, my site has been mobile-friendly. That’s right. Bookmark my site on your mobile device. 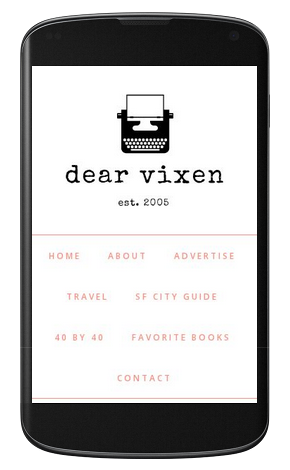 Dear Vixen is reader-tested, cell phone approved. Don’t forget you can get my posts sent directly to your email by subscribing (find the below graphic on my site header). It’s easy. No need to bookmark! 3. I’m slowly making improvements to my site. Baby steps. I added a page on some of my favorite books. Take a look and let me know if I’m missing something epic! Favorite books. 85 lbs? You are tiny! Congrats on the accolade. That’s awesome! Congrats on all the good things, Catherine. I hope you are able to take a breather over the holidays and lower that stress level a bit! Looks pretty awesome around here!! I’m so sorry about the stress. I know you must feel like you’re underwater..literally. I was 85 pounds in high school! I was shorter then but I remember people being so surprised when they lifted me up. Congrats! That is a really great list to make! Good job! And I love the book list! I love Jane Eyre. It’s probably my all time favorite classic! Congrats on the nomination! I give you major props for making it all work. I hear you! Parenting is hard and life outside of parenting makes it so much harder. I hope you do get to crawl into a cave and sleep for 8 hours straight. Truly! Congrats on the amazing accomplishments of your blog! You do such a great job so this is well deserved! Congratulation, Catherine! I honestly don’t know how you do it all! congrats in being listed as a top San Francisco blog, that is seriously amazing!! I also would like a decent 8 hours sleep. That would be magical. I am not surprised at all that you were nominated as a top San Francisco blogger. Your is one of my favorites. Also love your new favorite books page. I too don’t know how you find time for at all and give you major kudos. Hope your family had a great holiday and have a Happy New Year.